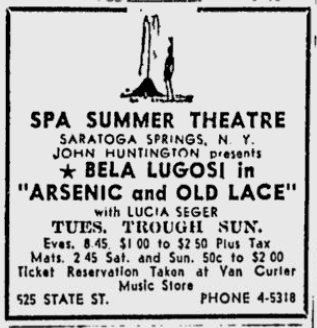 Because of strong preference for comedies, indicated by patrons of the Spa Summer theater, Producer John Huntington has requested Bela Lugosi to appear in “Arsenic and Old Lace” instead of in “Dracula” at the Spa theater during the week of Aug. 5 through 10. 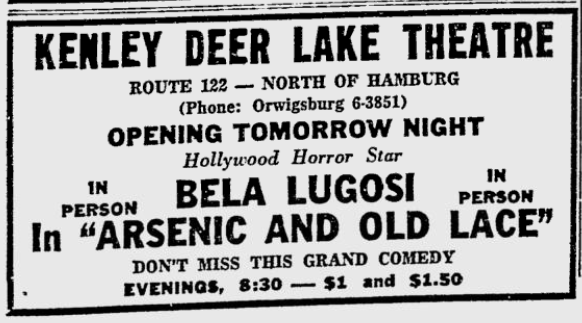 “Arsenic and Old Lace,” Joseph Kesselring’s celebrated comedy, opened at the Spa theater last night with Bela Lugosi, that bogey man of stage and screen, in the major role. Because theater audiences have evidenced a preference for comedy, the vehicle was submitted by producer John Huntington for the previously scheduled “Dracula.” Lugosi, who formerly played the role of the sadistic Johnathan Brewster on Broadway after Boris Karloff left the cast, combines his gift for the sinister with a sufficient knack for humor. However, the play could not have achieved its smooth precision performance were it not for the combined efforts of a thoroughly competent cast in support of the star. Bruce Adams, outstanding in this year’s resident company at the Spa, is excellent in the character portrayal of Dr. Einstein – he practically out-Lorried Peter Lorre. Judith Elder turns in a fine depiction of Martha Brewster, while Ruth Homond, another resident dependable, is excellent as Elaine Harper. Ted Allegretti brings down the house with his riotous interpretation of Teddy Brewster. The cast includes Lucia Seger as Abby Brewster, Ford Rainey in the challenging part of Mortimer Brewster, and Clyde Waddell as Rev. Dr. Harper. Most of you are probably acquainted with the wholly delightful plot of “Arsenic and Old Lace,” which, for the first time, takes murder as a theme and builds about it three acts of sheer comedy. The play will run through Sunday with performances at 8:45 p.m. There will be matinees Saturday and Sunday at 2:15 p.m. Note: On Wednesday August 6, Bela appeared on Backstage at the Spa to promote the play. See Bela Lugosi On TV for more details. NEW YORK, Nov. 8. – A new package featuring Eddie Foy Jr., and George M. Cohan Jr., has been set by Tom Elwell, former general manager for Hunt Stromberg Jr., who now is operating his own package agency. Show also features a 15-piece orchestra, female vocalist and chorus, with scripts penned by Marc Lawrence. Another new Elwell package stars Bela Lugosi, film horror expert and Comedienne Ann Thomas, in a comedy mystery show. Nelson Sykes is the writer.